There’s a new anchor tonight! Joining Cecily Strong at the oddly shaped desk that has been populated by the likes of Jane Curtin, Chevy Chase, and Tina Fey is Colin Jost. Instead of doing the regular thing and advancing through the cast members, Jost managed to make the jump from writer to Weekend Update anchor, one of the most coveted and recognized positions on the show. If it can make talk show hosts out of Seth Meyers and Jimmy Fallon, there’s gotta be some credence to it. I watched it, and…it was OK. Just that. Jost is better-looking and more “news-anchor”-y than Meyers or Fallon, but he seemed a little nervous (well, who wouldn’t be?) and not as shiny (maybe that’s the makeup, but it was more reminiscent of a nondescript news reporter than someone like Peter Jennings). I think he’ll provide a nice foil to Ms. Strong, which is why the Fallon/Fey pairing worked so well. 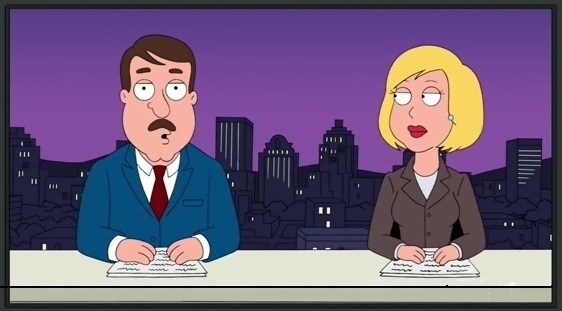 What I like best about Weekend Update is when the anchors can keep a straight face. We haven’t seen that since Tina Fey/Amy Poehler. Even Jimmy Fallon had a habit of breaking character and laughing at the camera sometimes. But I guess the trend has stuck. I mean, it’s okay to laugh at the jokes, but if that ends up being all you do, that’s not terribly funny. There is value in being able to play the straight man, and not like Seth “Perma-Press Smile” Meyers, especially when the guests do that enough themselves (I’m looking at you, Stefon.) Kenan Thompson kind of lost it tonight, but Jay Pharaoh kept it pretty cool. On the other hand, he didn’t have to look at his own hilarious face. Probably the best moment of tonight’s Weekend Update was Taran Killam’s 19th century Oscar critic, Jebidiah Atkins. Even at a technical glitch and Cecily’s incessant giggling, he played it straight and brought the funny. Writing about something funny is way more fulfilling than ranting. Now that awful, annoying dental insurance commercial is on. Oh, the show’s over. Thanks, Lorne, and welcome to Sierra Leone and valkomin to Iceland!